The British played a significant unsung role in advancing EU car safety regulations. But – just as the industry moves towards greater innovation – Britain wants to take a back seat. In the mid 1990’s over 45,000 people were killed annually in road crashes across the EU. Outdated 1970s crash test regulations were in force, leaving vital safety features like air bags as optional extras. Eventually, in 1995, it was agreed to upgrade EU vehicle safety standards. But, due to intense industry pressure, the European Commission’s original proposals barely increased the stringency of the requirements at all. 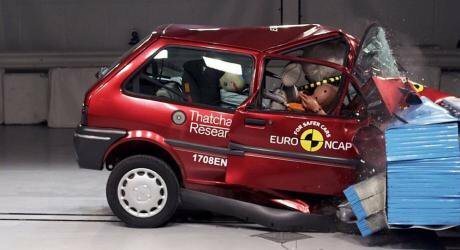 Tougher and more realistic front and side impact tests were relegated to a vague ‘second stage’, despite the fact that the UK’s Transport Research Laboratory (TRL) had shown that thousands of deaths could be avoided if the stronger and more realistic crash tests were applied. The opportunity for a radical improvement in these scandalously weak proposals came through the new powers given to the European Parliament to amend draft legislation, thanks to the Maastricht Treaty. The lead ‘rapporteur’ on the crash test legislation was the then Labour MEP for Tyne and Wear, Alan Donnelly. He tabled amendments based on TRL’s research which were supported by a pan European grass roots campaign organised by consumer and safety groups. They called for the immediate adoption of the tougher crash tests. The Parliament unanimously adopted Donnelly’s amendments and the new much more stringent crash test standards entered into force from October 1998. Twenty years on and the number of lives lost in crashes has dropped to 25,000 with improved car occupant safety the single most significant factor in this huge improvement in EU road safety survival, as this shocking video of a dummy crash test shows. This experience shows how it is possible to achieve a big win for the public interest in the Single Market. The industry lobby was defeated because the UK had shared sovereignty over regulations with other EU governments and the European Parliament. Post-Brexit, acting alone, it will be far harder for this country to similarly challenge the multinational lobbying power of the automotive industry. ‘Not so’ according to Britain’s Prime Minister, Theresa May, who claims there are international regulatory systems that we can rely on after leaving the EU. In her Mansion House speech last March, she argued that many EU product rules “are underpinned by international standards set by non-EU bodies of which we will remain a member – such as the UN Economic Commission for Europe (UNECE), which sets vehicle safety standards”. By going global, Mrs May implies Britain has nothing to lose. But her argument displays woeful ignorance of the reality of rule setting in the UNECE which is dominated by one large block of nations – you’ve guessed it, the EU. The UNECE’s World Forum for Harmonisation for Vehicle Regulations based in Geneva is an important global standard setting body. Today, 54 governments are parties to an international agreement for ‘type approval’ regulations that are critical to the safety performance of vehicles on our roads. At its meetings in Geneva about 38 governments usually attend including EU Member States, but with a crucial difference; the EU vote together as a block of 28 countries. Decisions in the World Forum require a four-fifths majority and this is easily managed by the EU, which almost invariably secures the result it wants. So Theresa May got it backwards. It is EU decision-making that underpins the adoption of UNECE regulations and not the other way around. So, outside the EU, even in the UNECE, the UK will be effectively just a rule-taker. This relegation to the second division in automotive regulations will have serious consequences for British consumers. Dieselgate exposed the lengths to which vehicle manufacturers are prepared to go to avoid compliance with regulations to protect air quality. Volkswagen’s blatant cheating of US diesel emission standards also exposed weakness in the EU’s regulatory system. Fundamentally, this was caused by a policy bias in favour of diesel technology due to its usually higher levels of fuel efficiency and lower CO2 emissions compared with petrol engines. The air quality issue of higher diesel emissions of nitrogen oxides were marginalised. Now, much too late, tougher standards together with a more robust type approval system are being applied; with the EU’s system exposed as imperfect and still very liable to corporate influence. In leaving the EU’s system of vehicle regulation, however, UK citizens are unlikely to find themselves in a stronger position vis a vis the motor industry’s corporate power. Our voice in the Council of Ministers and the European Parliament will not be heard and our influence gone. This will have profound implications for the interests of the public and our automotive industry. The Government is wrong to think that membership of the UNECE can side step the negative impact of Brexit. We will be less influential there, following rather than leading discussions in Geneva about future regulations. We will also be unable to participate in the EU’s framework programme for research and innovation that is closely related to the automotive regulatory process. This will harm our universities, research laboratories, and automotive suppliers. At a time of great innovation and change in vehicle technologies this is extraordinarily short-sighted. To sort out this Brexit mess, it is time that reality and a hard-headed assessment of the UK’s national interest should take precedence over the vague assurances offered by Theresa May. To retain a strong influence in global automotive policy making we need to remain in the Customs Union and the Single Market. This should be negotiated with a specific agreement to maintain UK participation in motor vehicle policy-making both in Brussels at the EU and in Geneva at the UNECE. That is the way for us to keep some ownership over a rule-making process that is vital for our vehicle manufacturing industry, environmental protection, and the safety of millions of us using our roads. David Ward is Secretary General of the Global New Car Assessment Programme. He writes in a personal capacity.